In the Murmansk region, 15 volunteers are trying to put out massive wildfires. And instead of equipment, they are being offered prayer as help. In the Murmansk region, the Lotta border crossing point to Finland was closed for the first time. The reason was that the checkpoint was surrounded by fires. Finns watching the fire spread sounded the alarm that the flames were about to cross the border. As a result, the Finnish border guards themselves joined in to help fight the fire and provided a helicopter. And when the fire blocked the road in the direction of the border, fire fighters from all over the Murmansk region were called down. Meanwhile, the flames were already moving to Salla, another checkpoint. 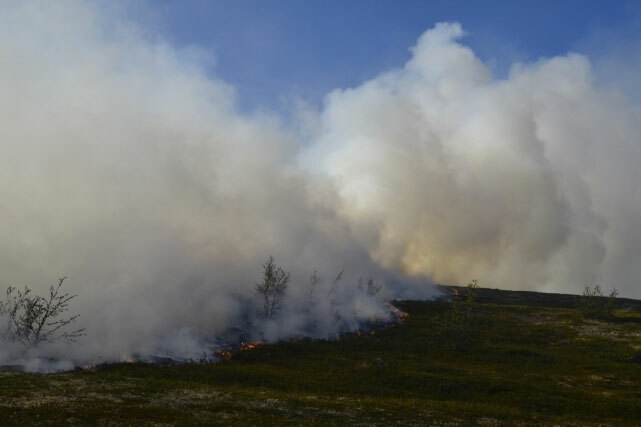 And then there were more fires in other parts of the Kola Peninsula. The cause? A record heatwave, up to 32 degrees and no rain. And so the tundra burns and there is no one to put it out. A total of 20 large fires have been registered on the peninsula. 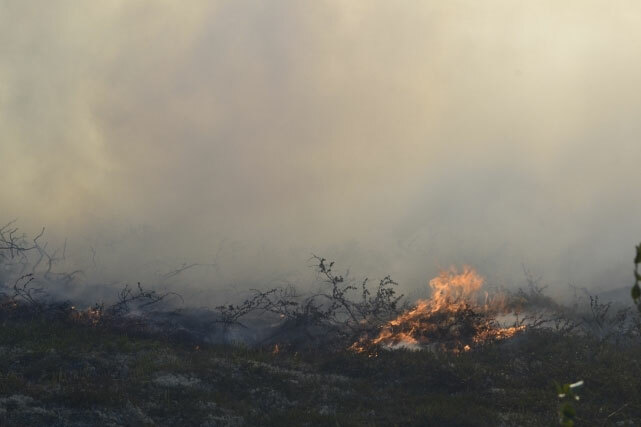 The Lapland nature reserve is on fire and it is burning in the Kandalaksha, Lovozero, Pechenga, and Kola districts and there are fires in the vicinity of Teriberka. Local government officials are in the village of Teriberka for a festival with songs, dances and guests. It is rare to have officials visiting in this region but this is clearly not an opportune moment. The songs seem depressing now as residents are afraid to open their windows because of the caustic smoke and the road from Murmansk is black with soot. But the point is not that there are fires but that there is no one to help put them out. Right now, the region has neither the manpower nor the economic means to fight the fires near this village. Vladimir Kichigin, the former head of the Teriberki fire department, explained the situation as we drove out to look at the situation: «The main problem is that the state fire service has no right to fight fires any further than 200 meters from the road. And of course they don’t have the correct equipment to fight fires more remote than that. This job is one that calls for aerial firefighting. And probably we should have contracts for this but there is no money for any such contracts, so there is no one to put out the fire. So now we are just pooling our resources and our volunteers are heading for the most intense areas of the fire to try and fight. «What we really need are special knapsacks. They make these with a pump, you know? They have motorized pumps and we need to connect these to a smaller diameter hose to increase the pressure. All of these are absolutely worth the money but we don’t have anything. We used to go out there with plastic water bottles, poke holes in the lid and just sprinkle water on the Fire. Pretty pathetic really. Our first stop was 67 km in. The smoke was already reaching the road and we could see a single fire engine in the distance. However, the fire truck was at least 300 meters from the fire and volunteers were taking water from the hoses in buckets and carrying it by hand over to the fire. In total, there were three volunteers. The fire commander was wearing a T-shirt and tucked-up pants and he was indistinguishable from the volunteers and fighting right alongside of them. All four had firepacks and shovels. The fire was spreading and his people were getting burned. The volunteers would go into the smoke and come back spitting and wiping sweat from their brows. They would get some more water and head back up the mountain 300 meters away to where the flames are. The ground under their feet was black and burning. They didn’t have either gas masks or respirators. Their eyes were red and inflamed and gusts of wind raised clouds of ash and smoke. Vladimir Kichigin asked why they hadn’t driven the truck off the road at least part way up the hill or at least used some of the 180 meters of hose that they had to get a little closer and save the men some walking. Yesterday, local officials put out the call for volunteers over social networks and promised 5.000 rubles per day (about 70 euro) for helping to work on the fires. In the comment section, one man wrote that the number was actually only 50 rubles but by the time the bus got there, about a dozen men from Murmansk, Kola and Severomorsk were waiting. Vasily Levin, the head of the security department of the Kola district, was surprised that nobody from Teriberka was among the volunteers. «This is the second time that we have had to call for volunteers.» Kichigin continued, «Two years ago, there were fires in the Orlovka district and we also asked for people. There were some border guards that got off the boat to help but there was no equipment for them to fight the fire with. All we could do was give them some buckets. Our hoses and motor pumps were not worth a penny. The pump probably cost 15,000 and the hoses maybe 1.500. And the backpacks maybe cost 3.000. We’re talking about kopeki spent on everything and for what it was worth, it was better off back in the warehouse. And then of course, there was no water source. So what were we supposed to use? Teapots? Bottles? You know, on the TV shows they have got water rockets and modern equipment. But here on the ground, what do we have? «The ministry of emergency situations created a huge number of voluntary fire brigades the last time they released an order. But basically these brigades consisted of a bunch of women in high heels. Of course, in the authority’s report, everything is fine. We passed by another place where the fires were burning. Kichigin said they would never get to it and they could never put it out. «When the tundra is burning, even the helicopter will not help.» And there is actually a helicopter, one of them, and 10 paratroopers have been sent to Murmansk from Vologda, this as a result of an official request for assistance to neighboring regions. But the ministry of emergency measures has only been using these men in Murmansk in demonstration exercises and in one of their official comments, they gave this as the reason why these men were not available for the fire. We came across our third fire on the far side of a lake. 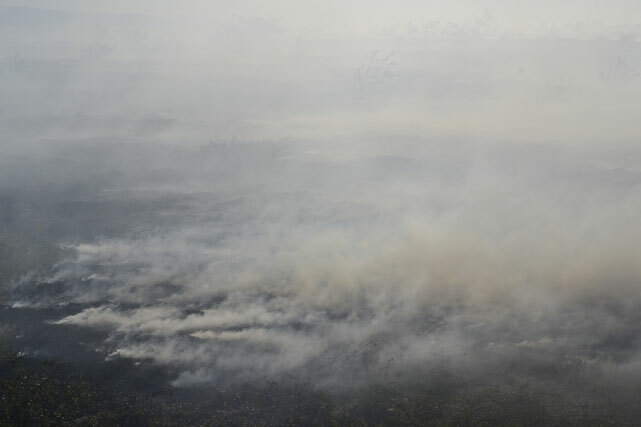 The region that was burning was perhaps 2 to 4 kilometers long. A dozen volunteers had set out on a boat try to put the fire out and they had been working for 4 hours with no visible success. These men did not even have a pump and they were collecting water in their backpacks from the lake and marching 200 meters to the fire which would come out to meet them against the wind. Vasily Levin stood on the shore watching the fire. He was wearing a t-shirt and his cap carried an inscription naming Putin «The most polite president». When asked if the volunteers would return the next day, he only shrugged and sighed that it was unlikely. «Having listened to their conversation, it is clear that we should not plan on it. I asked him if prayer actually helped.